A more equal world by enabling everyone to understand the Terms and Conditions better which are pushed by almost all online services. People with legal or IT knowledge may have an edge and understand irrespective of prior legal or IT knowledge. It parses terms and conditions from different websites and summarizes the findings, also takes in different options which users may be concerned about and informs which specific lines talk about those topics. 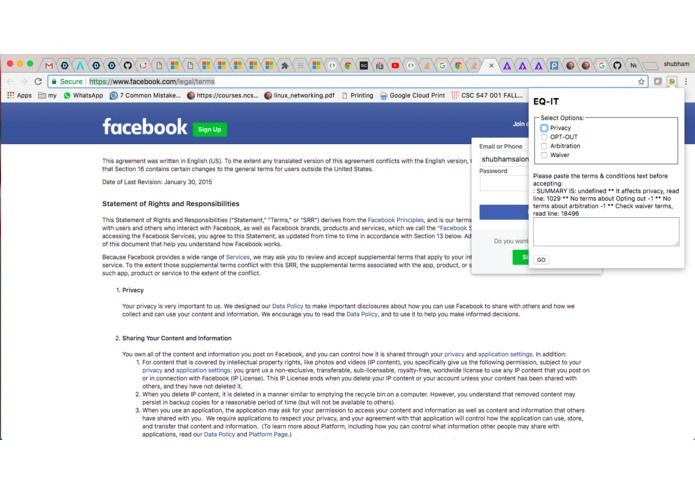 We built a chrome extension, We modified an existing open source project (retaining its license) which was for budgeting. The integration with microsoft azure API couldn't happen. Also tried similar text summarization APIs from algorithmia.com, couldn't get the results to display. Learning various text analytics tools and algorithms. Working with microsoft azure APIs although couldn't make it run, it was a good learning experience. good backend support to properly do text anlytics further it can also suggest users if they should agree or not and how exactly it may impact them.